The popularity of reflexology as a therapy is growing while more and more people turn to natural treatment. More than ever, people are inclined to take responsibility for their health and become more aware about the healthy nutrition, physical exercises and relaxation; the greater and greater number of people try complementary medicine methods since they are more worried about the side-effects caused by strong medicines prescribed by their doctors. The foot zone therapy improves the work of organs, reduces stress and body pressure, improves the state of health. It is used both for the illness prevention, treatment and even the post-treatment of severe diseases. Human body is full of reflex points, which locate in a regular manner as the zone systems. Through such points it is possible to enhance the work of organs, reduce stress and the body pressure and improve the state of health. In the case of an anticipated problem, the acupuncture of a corresponding point sends a pain sensation to the organ. In the case of anticipated problems or suspicions you should consult a medical specialist. Frequency of the therapy varies from one time per week to every day in case of the acute problems, when certain zones are treated and a session is shorter. During the therapy, a patient’s condition may change significantly, such changes are monitored and taken into the account in a next session with the aim of treating more carefully the zones, that have become active. The therapy is aimed at enforcement of the hormonal and immune system, reduction of stresses and muscle rigidity, improvement of breathing, metabolism and blood circulation, pain killing, sedation, relaxation and relaxing. During or immediately after the therapy the following reactions may occur: perspiration, tremor of the body or some part of the body, desire to urinate, risibility or tearfulness, sleepiness, a feeling of lightness, warmth and general relaxation. A couple of hours later or over a few next days after the therapy the following sensations may occur: sensitivity in the treated zones, accelerated metabolism, skin sensitivity, the increased discharge of mucus in breathing passages, disease recurrence for a day or two, enforcement of the immune system, changes in quality or time of sleep (decrease, increase), rise/fall of appetite. You are welcome to book appointment with Skinmed specialist. 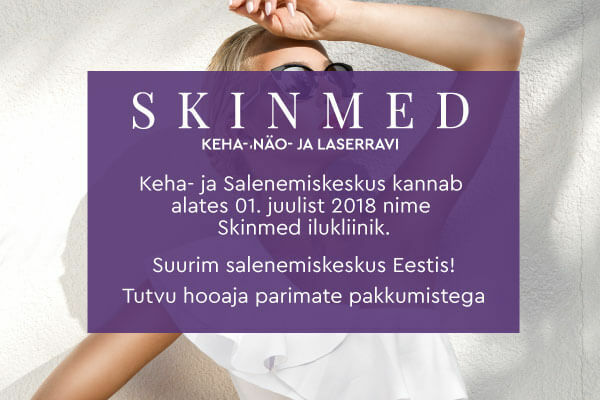 Skinmed Beauty Clinic offers the most contemporary and professional medical laser, facial and body treatment procedures in the Baltic States and Scandinavia!